Title: 12/11/1987 - Clarification of requirements for 40 hours of training. ; Site specific training is required for employees who receive general training. This is in response to your inquiry of September 22, requesting whether the certification program you described is equivalent to the 40 hours of training required in paragraph (e)(2) of 29 CFR 1910.120 (Hazardous Waste Operations and Emergency Response). The requirements of 29 CFR 1910.120(e) are somewhat job specific. That is , the employer will have to determine what training is necessary for his employees to knowledgeably and safely perform their job functions. Thus, it is not the intent of 29 CFR 1910.120 for the Occupational Safety and Health Administration (OSHA) to approve or disapprove generic courses or certifications. If the certification program described in your letter is determined by an employer to meet the general training needs of any employees, those employees would also need site specific training on the items described in 29 CFR 1910.120(e)(1). This training could be done on the site. Prior to the passage of the Superfund Amendments and Reauthorization Act of 1986, I was certified as a Hazardous Materials Manager by the Institute for Hazardous Materials Management. To obtain this certification I was required to pass a four hour examination. I would appreciate your reviewing the attached material and determine whether this certification is equivalent to the 40 hours of training now required by OSHA for people engaged in activities that might expose them the hazardous substances. 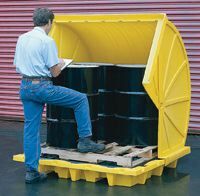 Get your spill control pallets and more at Safety Emporium. The Institute has just published a most needed HAZARD CONTROL INFORMATION HANDBOOK. It contains selective and essential sources of information on all aspects of Accident Prevention including Occupational, Product and Environmental Safety & Health. It includes listings of Computer Data Bases, Books, Journals, Standards, Federal & State Agencies, Professional and Technical Associations, College Degree and Continuing Education courses. The Handbook features practical and comprehensive sources of information on all aspects of Safety and Health including environmental, product and occupational. It provides intelligence and knowledge for meeting the resource and information needs of consultants, industry government and academia on managerial, professional and technical developments in loss control and accident prevention. Computerized data bases information centers, libraries, and directories. Federal and state government legislative, regulatory and agency activities and contacts. Professional and technical organizations including associations, societies, standards development, and certification. Safety and Health journals classified by content. Educational activities including college degree programs and continuing educational courses, identifying the organizations involved. To Order: Send $19.00 plus $2.00 for postage and handling to: Hazard Control Management, 8009 Carita Ct., Bethesda, Md. 20817. The CERTIFIED HAZARD CONTROL CONSULTANTS directory, listing high caliber professionals in all aspects of safety and health, is also available on special at $15.00. If purchased with the Handbook the price is $10.00. All orders must be prepaid. A. Resource Conservation and Recovery Act. B. Safe Drinking Water Act. E. Occupational Safety & Health Act. A CHEMISTRY OF HAZARDOUS MATERIALS, by Eugene Meyer, Prentice Hall, Inc., Englewood Cliffs, N.J., 1977. HAZARDOUS WASTE & MATERIALS MANAGEMENT, Bureau of Law & Business, 64 Wall St., Madison,CT., Tel. (800) 521-0136. CHMM. Butterworth Publishers, 10 Tower Office Park, Woburn, MA 01801, 1983. 287 pages. ENVIRONMENTAL AUDITS MANUAL, 3rd Ed., Government Institutes Inc., 966 Hungerford Drive, # 24, Rockville, MD 20850, 1984; Tel. (301) 251-9250. A step by step guide to conducting environmental audits. MANAGING hazardous SUBSTANCES ACCIDENTS, by Al J. Smith, Jr., McGraw-Hill Book Co., New York, NY, 1981. 187 p.
TOXIC SUBSTANCES CONTROLS PRIMER, Bureau of National Affairs, Washington, D.C., 1984; Tel. (1-800) 372-1033. 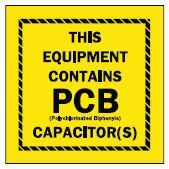 Get your PCB and hazardous waste labels fromSafety Emporium. Compliance standards, work practices and state of the art. Attached is a copy of the CHMM program explanation and requirements for recertification. The first three-year reporting cycle will be for the period July 1986 through June 1989. Three Annual Certification Maintenance Points Reports for the years July 1, 1986 through June 30, 1987, July 1, 1987 through June 30, 1988, and July 1, 1988 through June 30, 1989 will be due in July 1989 for those diplomates certified in July 1986 or earlier. Your official certification date is the one listed on your certificate. If you are certified on or before July 1st, your recertification will start in July of that year. For those diplomates who are certified after July 1st, the recertification year will start in July of next year. Certification maintenance reports will be mailed out annually with the certification maintenance data billing. It is strongly urged that you file your documentation and records per- training to recertification in a separate folder by year. Reports will be submitted to the Review Committee on a three-year cycle. Do not forward separate yearly reports. The first reports will be due on July 1, 1989. 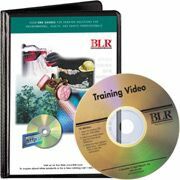 Hazardous materials spill cleanup training DVD's and other safety training materials are available at Safety Emporium.